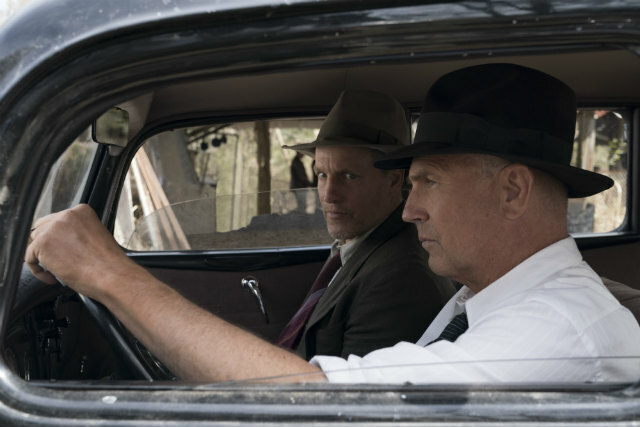 'The Highwaymen' sees Kevin Costner and Woody Harrelson play two police officers who emerge from retirement for a very special assignment. They play real-life figures Frank Hamer and Maney Gault, a pair of Texas Rangers, who attempt to track down notorious criminals Bonnie and Clyde in the 1930s. However, their task isn't just to arrest them. The job is to take them out. 'The Highwaymen' has a lot of things going for it from the offset. First-off, you've got Costner and Harrelson as the leads, two of the most charismatic actors working today. You've also got John Lee Hancock as the director, whose last three credits - 'The Blind Side', 'Saving Mr Banks' and 'The Founder' - impressed many. You've then got a literally note-perfect soundtrack from Thomas Newman ('Skyfall', 'WALL-E', 'American Beauty'), who knows how to capture the right atmosphere for every film. Penning the film is John Fusco, screenplay writer for Western-type films like 'Young Guns', 'Hidalgo' and 'Spirit: Stallion of the Cimarron'. Does he infuse that sensibility in 'The Highwaymen' as well? Indeed he does. After all, the whole coming out of retirement to take on one last heroic deed originated with the Western. The generic roots aren't lost on Fusco as he has Kathy Bates, in the role of Governor Ma Ferguson, refer to the rangers as 'cowboys'. Later, a shot of Harrelson's Gault is most definitely a reference to 'The Searchers', if you know your old movies. But the Western references aren't overly leaned into either. You'll also recognise tropes of crime/mystery dramas such as the old guys being disrespected by the young fellers (in this case the FBI), who get shown up as our leads prove they're smarter and have greater experience more than once. It's a fine movie that keeps you invested, mostly because Costner and Harrelson are such pros. The former has such presence as a leading man while the latter brings characters to life with force. Their chemistry is note perfect while they also get their time to shine in a couple of scenes individually. For Costner, it's the scene where he talks to Clyde's father. Harrelson's stand-out moments include a bathroom brawl and haunting story narrated during a poker game. The movie touches on a lot of topics, such as the nature of violence and the line between law enforcers and law breakers, without really exploring anything in depth. 'The Highwaymen' also does a good job at portraying the insane fame surrounding Bonnie and Clyde. Idolised and glamourised for robbing banks and freeing prisoners, they killed a lot of innocent people, yet people just went nuts for them. 'The Highwaymen' is more a drama than the action-thriller hinted at in the trailers, a bit long and the pacing a bit off. Generally, it is enjoyable, just not quite exceptional; it is recommendable without being unmissable.